A simple NeuroMatic tab that provides a template for creating user-defined tabs and functions. To add the Demo Tab to NeuroMatic’s control panel, select the “+” tab (see image below) and add “Demo”. Incorporate your own Macros into the Demo Tab by entering them into the procedure file NM_DemoTab.ipf (Igor Menu/NeuroMatic/Procedures/Tabs). You could, for example, place your function call within the function NMDemoCall. Or create your own tab by copying the Demo Tab procedure code NM_DemoTab.ipf to a new Igor procedure window (Igor Menu/Windows/New/Procedure...), replacing all instances of the word “Demo” with your own tab name (e.g. “FRAP”) and saving the procedure file (Igor Menu/File/Save Procedure As...). Further instructions are inside NM_DemoTab.ipf. 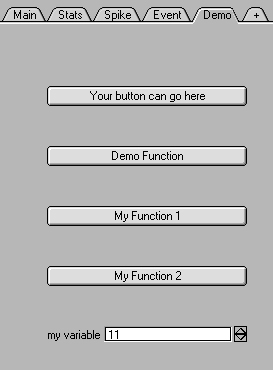 The Demo Tab procedure file NM_DemoTab.ipf (Igor Menu/NeuroMatic/Procedures/Tabs) includes several demo functions (e.g. NMDemoLoop, NMDemoLoopThruChanWaves, NMDemoLoopThruFolders) which you can use as templates to create your own user-defined functions.